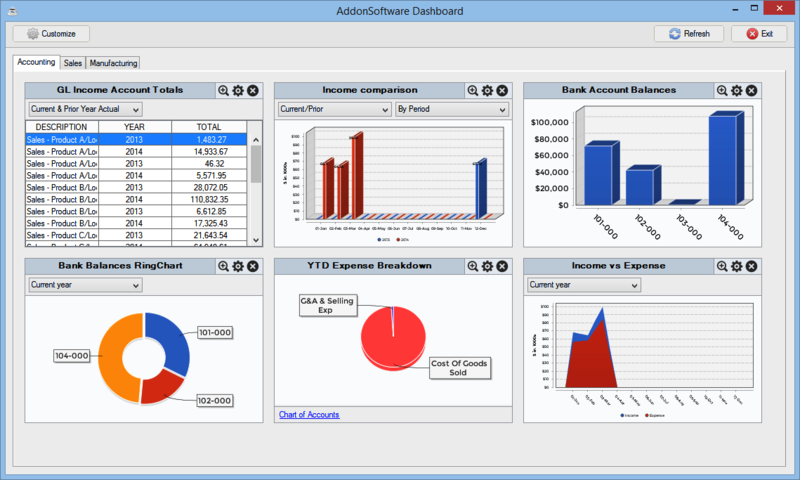 With the AddonSoftwareGeneral Accounting System, generate user-defined financial reports any time of the month – current and historical financial information is always up to date. Output financial reports directly to spreadsheets – no need to print them and re-enter the data into Excel. Send any report via e-mail or fax, or output in HTML or Adobe® PDF format at any time. All of the General Accounting applications are feature rich and fully integrated for easy, one-time data entry. They are mature and proven, and they are also fully integrated with the Distribution and Manufacturing bundles. The Accounting bundle is comprised of Accounts Payable, Accounts Receivable, and General Ledger modules. AddonSoftware also offers fully integrated Distribution (Inventory Control, Sales Order Processing, Purchase Order Processing, Sales Analysis) Payroll, and Manufacturing bundles (Bill of Materials and Shop Floor Control) ERP bundles.